Arguably one of Morocco’s most visited city, Fez is much more than just a tourism hub. Its history dates back over 1200 years and its significance to Morocco goes much beyond its charm and appeal to the tourist masses. Fez has been the country’s spiritual and intellectual center for centuries. Surprisingly, despite its huge popularity as a travel destination, Fez remains today one of Morocco’s most authentic cities with a centuries-old medina that has kept many of its traditions alive. You’ll find plenty to explore in Fez, from one of the world’s oldest universities to the largest intact medieval quarters. Tucked away in the alleyways of the Fez medina, Riyad Al Atik may not be easy to find – but it is undoubtedly worth the extra effort. 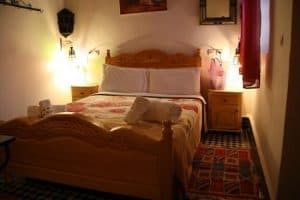 Located within easy walking distance from the Blue Gate, the friendly bed and breakfast is perfect for those looking to explore Fez on foot. Plus, each of its five guest rooms is individually decorated to provide a unique experience to all its guests. 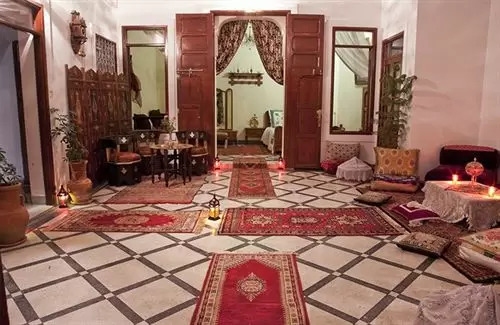 Families looking for a peaceful oasis in the heart of the Fez medina will love Riad Zitouna. Located in the quiet area of Zkak Bghal, the riad offers an authentically Moroccan experience with modern comforts. Its five suites overlook the interior patio which also features a swimming pool. And your hosts Agnes and Brahim will go above and beyond to attend to all of your requests. They also can arrange day tours of Fez and its surrounding area and even coordinate fun activities (like cooking lessons) for you. 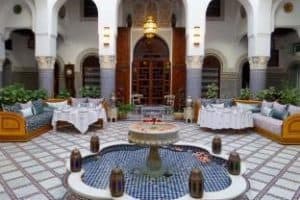 Dar Mehdi is as Moroccan as it gets: zellij tiles fill the walls, traditional carpets line the floors and wooden carvings complete the interior décor. 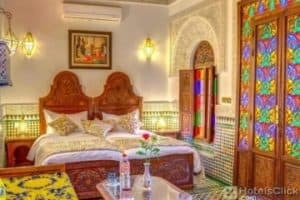 Located in the north area of the Fez medina, this authentic riad will leave you minutes from the splendid Madrasa Bou Inania and the University of al-Qarawiyyin. Onsite, Dar Mehdi offers 4 guestrooms with fantastic views of the medina and fully equipped with flat screen TVs and air conditioning. 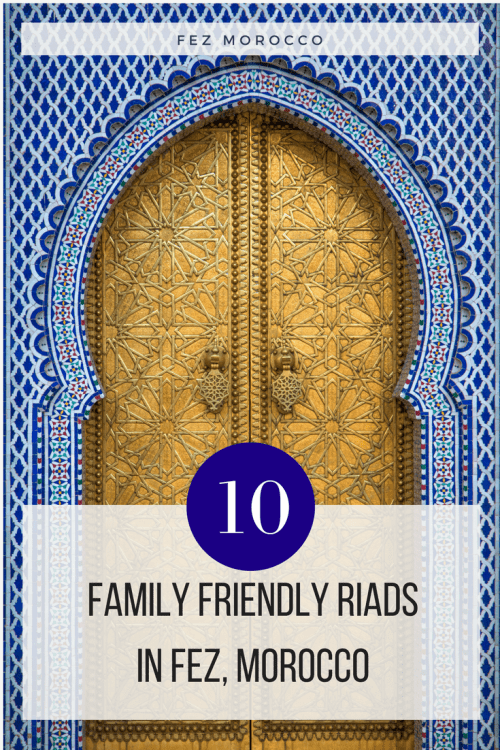 Located outside of Fez, Riad Ksar de Fez could easily be overlooked as a convenient accommodation option for families. 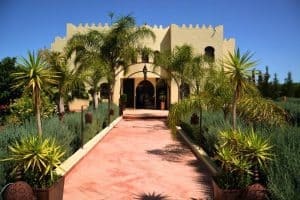 But the riad makes the most of its location in a 3-hectare estate to offer its guests an unforgettable stay. 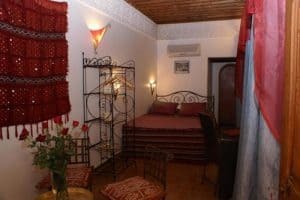 Besides the usual guestrooms and spacious suites, Riad Ksar de Fez also offers 2 douirias (small traditional houses) to welcome families big and small. The onsite restaurant serves a mean tajine and some delicious couscous too, so make sure to book at least one dinner there. Recently built, Villa Agapanthe is the perfect blend of hotel comfort and guesthouse charm. 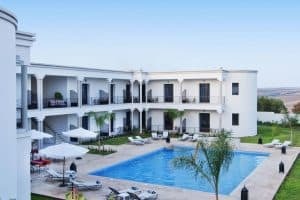 It is nestled in the countryside right on the outskirts of Fez and features a stunning swimming pool with views of the High Atlas and 17 different rooms with private balconies. The onsite restaurant serves some delicious Moroccan food, but your little ones can choose from the children’s menu if they prefer. Featuring 9 traditionally Moroccan guestrooms, Riad La Maison Verte will be your home away from home. At the reception, you’ll get all the help you need organizing day tours and the kitchen staff will tailor all your meals to your dietary requirements. 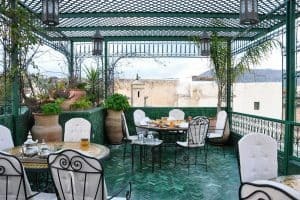 Plus, the riad is located just steps away from the open air tanneries, the University of al-Qarawiyyin and Nejjarine Fondouk so you can explore the very best of Fez on foot! 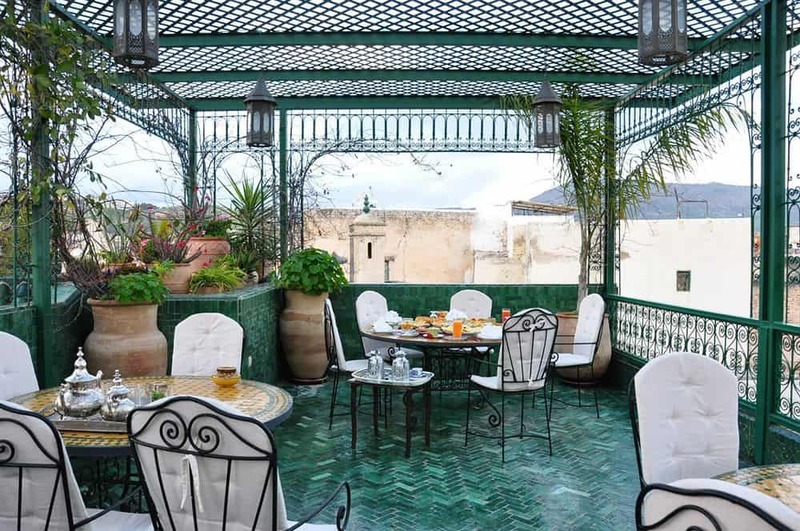 Riad Attarine is located in the heart of the Fez medina and offers 5 guestrooms (all named after Moroccan spices, by the way) which sleep up to 4 people. The best part though? Children under 9 years old sleep for free when staying in their parents’ room! You can also take advantage of their day tours which explore both Fez and its surrounding region, including the famous ruins of Volubilis. 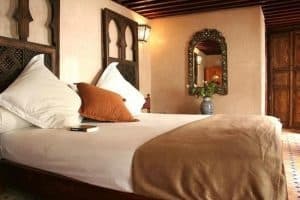 With 14 air-conditioned guestrooms, 2 delicious restaurants, a hammam and a breezy rooftop terrace, there’s nothing you can possibly need that you won’t find at Riad Dar Dmana. Located in the Fez medina, the riad offers a personalized service to attend to your every need. Plus, if you’re staying for more than one week, the staff will arrange a complimentary airport pickup service. Located in the Fez medina, Riad Lalla Fatima is an excellent riad offering a variety of fun activities to keep the whole family entertained. Henna tattoo sessions will make for a cool (and unique!) family travel memory. But if food is more your thing, you can take a cooking lesson as a family – starting with a shopping trip in the medina and ending with a delicious meal! So make yourself right at home in one of the riad’s 10 guest rooms and explore all that Fez has to offer. Riad Dar Skalli is one of Fez’s most special places. 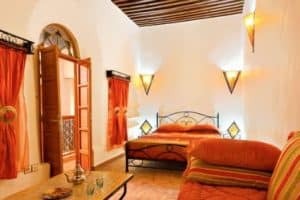 Situated in the Batha district, the riad features a lovely rooftop terrace with panoramic views of the medina and a peaceful interior courtyard furnished with a fountain, plants and lounge chairs. Complimentary baby cots are provided and children under 4 years old stay for free when using an existing bed. The staff can also help you plan your trip in Fez, arranging guided tours of the medina and day tours to just about anywhere you can imagine. Fez is a great place to visit with or without kids! Whether you want to stay in the medina or outside in a villa there’s something for everyone on this list. Want to read more? 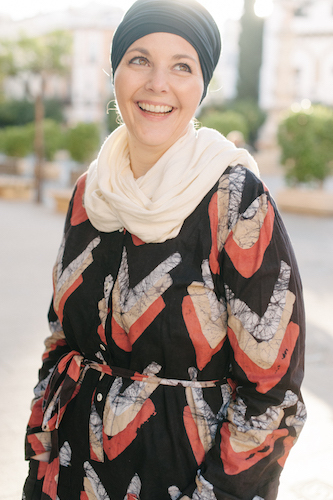 Check out my post on Everything You Need to Know about Fez, Morocco before you go!